^ Mendeleev - 門得列夫. terms.naer.edu.tw. [2016-10-25]. ^ Rustest.spb.ru. Rustest.spb.ru. [13 March 2010]. （原始内容存档于2010年9月22日） （俄语）. ^ 5.0 5.1 董騰元. 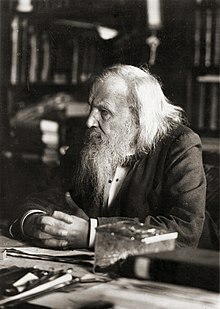 門得列夫（Dmitri Mendeleev） Ⅱ. 國科會高瞻自然科學教學資源平台. 2008-07-23 [2014-01-29] （中文）. ^ Johann Wolfgang Dobereiner. [2008-03-08]. ^ A Historic Overview: Mendeleev and the Periodic Table (PDF). [2008-03-08]. ^ A brief history of the development of the period table. Western Oregon University. [2014-01-28] （英语）. ^ 蔡永彬. 化學元素解析／原子量不固定 科學界新共識. 新聞中的科學 (聯合新聞網). 2011-01-10 [2014-01-28]. ^ 钟樊文. 门捷列夫与元素周期律的发现. [2009-07-28]. （原始内容存档于2010-02-13）. ^ ВНИИМ Дизайн Груп. D.I.Mendeleyev Institute for Metrology. Vniim.ru. 2011-04-13 [2012-08-20]. ^ Saint-PetersburgState University. Museum-Archives n. a. Dmitry Mendeleev - Museums - Culture and Sport - University - Saint-Petersburg state university. Eng.spbu.ru. [2012-08-19]. （原始内容存档于2012-10-24）. ^ University homepage in English. [2014-01-28]. （原始内容存档于2017-01-09）. ^ Dmitri Mendeleev’s 182nd Birthday. Google Doodle. 2016-02-08 [2018-02-09] （英语）. Gordin, Michael. A Well-Ordered Thing: Dmitrii Mendeleev and the Shadow of the Periodic Table. New York: Basic Books. 2004. ISBN 0-465-02775-X. Strathern, Paul. Mendeleyev's Dream: The Quest For the Elements. New York: St Martins Press. 2001. ISBN 0-241-14065-X. Mendeleev, Dmitrii Ivanovich. Principles of Chemistry. New York: Collier. 1901.